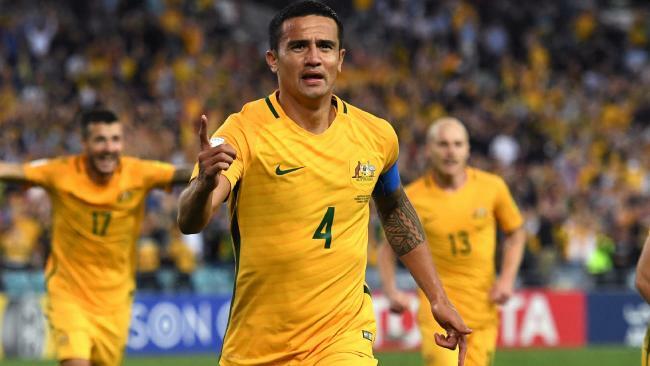 SOCCEROOS legend Tim Cahill says he's open to offers as he looks to extend his career despite calling time on his Socceroos days - but has shut the door on a return to the A-League. 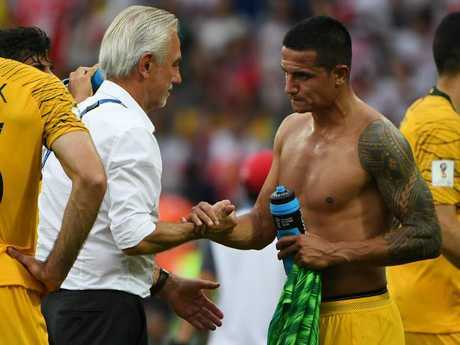 Cahill opened up on his experiences playing in his fourth World Cup, as well as being used in a diminished role under coach Bert van Marwijk as Australia struggled to crack games open with their talismanic striker on the bench. The 38-year-old got emotional when reminiscing about his exceptional career, and the support he's had from his family, but says he won't be finishing his career in Australia - suggesting a move back to the MLS in America is in his sights. Cahill played 28 games for Melbourne City, scoring 11 goals, in his lone A-League stint but there'd been suggestions he was being courted to have another crack. "I have heard whispers about (returning to) the A-League," Cahill said. "I will be open and honest, my experience was fantastic, my debut is something I will never forget. "To live in America and play in the A-League is impossible so respectfully I will draw a line in the sand about me coming home. That should stop any whispers." Straight after the World Cup and leading into it, the six months before, every decision I made was for my country. To help the team, help the players and then afterwards I wanted to have a free mind and reflect. I had an inkling on holiday that I wanted more time, but the support from my family, I felt, four World Cups, Asian Cups and Olympic Games, amazing moments. I thought do I want to play in the Asian Cup? I would love to but a lot of pressure comes with being a footballer, my family get concerned. For me it is the right time. I can pass the baton on. Arnie can prepare, I can be there for the boys. I'm not going anywhere really, I will always be their mentor, I always try and make a massive impact on the players especially about what it means to play for your country. This wasn't an easy decision, I want this to be a good moment. It's a big decision to retire when you know you can still kick a ball. Mentally and physically this was the perfect decision. Goal would have to be the first ever in a World Cup, you're so proud when you first put on that jersey. 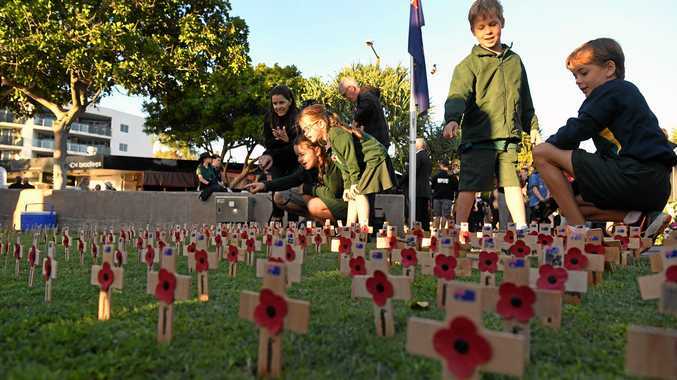 Every single day now I have stopped, none of this has sunk in. The next camp will come around and then I will have to realise it's becoming a reality. Goals are a reward but I play every game like it's my last. You never know when it is going to end. There are so many goals, they all mean so much whether a tap in or a great strike, there are so many moments I am proud of. At 33 years old and you have done 3 World Cups, one thing I have learned, especially when playing for your country, all I care about is the team, it's all about them. I knew I would get my time (In Russia) that is what I was preparing for in the 44 days. In Turkey I did everything possible, I never missed a session, I knew I would get a moment and I got it against Peru. I can't thank everyone for their support. Frustration is a word used because others would have wanted me to play more but for me it was an honour to play a fourth World Cup. A player has to think a lot bigger than himself. I feel that is why I am fine retiring, there was nothing I didn't do on and off the park. When I saw the support I was surprised. In the end I got the support that we all deserve, it was a great experience. 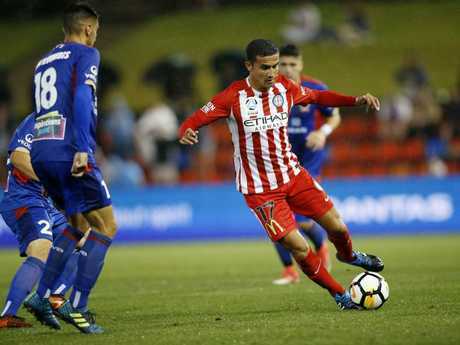 Tim Cahill scored 11 goals for Melbourne City before leaving in bitter circumstances. I've had a few conversations with Arnie and the FFA who have been so supportive. I am always someone who keeps the cards close to the chest. When you make a decision like this it has to be your own, it has to be organic. That's what I wanted; I wanted this to be my decision. I am interested in coaching; I want to help do great things for soccer in Australia. I want to ensure I can still be an ambassador for the A-League. I will go to the UK for my UEFA license, then I will open a door for offers to play football, Ive not really entertained anyone yet. I've been selfish and had some family time. Domestic, there could be opportunity but I have time to decide. I have heard whispers about the A-League. I will be open and honest, my experience was fantastic, my debut is something I will never forget. To live in America and play in the A-League is impossible so respectfully I will draw a line in the sand about me coming home. That should stop any whispers. There weren't many conversations I don't think many players had any. I just made sure they knew that if they needed me I was there. It was probably one of the best environments I have been in from a World Cup campaign this time around. USAIN BOLT TO THE A-LEAGUE? He is a fantastic world class athlete. He has to prove fitness and that he can play football. If he can they let's see. All that matters is what the fans what. I can't comment on if he can do it because I have never seen him play. But let's make sure we protect our game. When we talk about players - Iniesta, Torres, let's be realistic. These players are on tax free money, a lot of pressure gets put on clubs and the FFA. Everyone needs to work in harmony to grow the game.